Sabor Modern Mexican specialty restaurant has become a popular dining choice for many Royal Caribbean guests because of the great tasting food, primarily the guacamole. Since the restaurant opened in 2014, the guacamole has been the centerpiece of the terrific culinary choices available but in early 2017, word came down from other guests that Royal Caribbean was not making the guacamole table side anymore. In the name of research, I decided to investigate if the rumors were true, and if the product has changed at all. Navigator of the Seas is home to the very first Sabor location, and while the restaurant has spread to other ships in the fleet, it retains a special place in my heart for nostalgic reasons. Great service, even better food and a quiet atmosphere combine to provide guests one of the best dining experiences on any Royal Caribbean ship. But would the change in guacamole preparation degrade the experience? We made a number of reservations over the course of a recent cruise to determine fully what the state of affairs is with Sabor Modern Mexican. When you hear of a Mexican restaurant, I am certain most people imagine a restaurant with lots of large woven hats strewn about, fake cacti, and a Mariachi band playing. Royal Caribbean has none of that at Sabor Modern Mexican. Their aim was to design a restaurant that retains favorite Mexican dishes, but also offers a more contemporary look and menu. Located near the forward on deck 4 of Navigator of the Seas, Sabor Modern Mexican is across from the Schooner Bar and near the forward elevators. The restaurant is not that large, and has seating along the walls and interior. There are no windows that look out to the ocean either. What you will notice are plenty of dark reds, bright yellows and deep blues. The only real hint that this is a Mexican restaurant is the use of dahlia flowers in much of the decorations. The big question about the food at Sabor on this visit was about the state of the guacamole. I had read in the weeks leading up to the cruise that the table side guacamole is no more, and the guacamole is now prepared in the kitchen. I was concerned there would be this giant vat of guacamole created each day, and servers would scoop from it when serving, almost like how ice cream is served. As we were seated, our waiter asked us how we would like the guacamole prepared. I asked if the guacamole was being made table side and he indicated it was not being done table side any longer. Later in the cruise, I spoke with Navigator of the Seas' Food and Beverage manager, who indicated a new health regulation by the United States forced the cruise line's hand in how they operated. We asked for the guacamole to be prepared in two ways, one spicy and one medium. The waiter disappeared for a few minutes and returned with two bowls of fresh guacamole that tasted exactly like it has on all my previous trips. While I prefer the spectacle of the guacamole to be prepared in front of us, I can assure the general public that Sabor's guacamole is still amazing. My favorite is the Avocado Margarita, but the Jalapeno-Cucumber Margarita comes in a close second. If you prefer a more traditional margarita, the Sabor Grand Margarita is an excellent choice. If you are looking for something a bit stronger, try one of the tequila flights. There are two varieties, and they each offer exceptionally smooth tequila that offers a good sampling of the different types of tequila. The Sabor menu is broken up into a few basic categories. Guests may order as many items as they like from any section. The Platos Chiquitos are essentially the restaurant's appetizers. The most popular choices are the queso fundido and the chicken-stuffed jalapenos. The fundido is warm, melted cheese and it is less like traditional cheese dip, and more like a serving of cheese sticks, minus the breading or stick shape. There is a lot of cheese in this dish, so come hungry. The jalapenos are a crowd favorite because they are wrapped in bacon and have a little kick to them. This is a great choice for sharing (assuming you actually want to let any out of your sight). The main part of the menu is comprised of tortilla-based favorites and platos fuertes. Tacos, quesadillas and burritos make up the tortilla section. You will find your traditional Mexican items, like beef tacos, cheese quesadillas and burritos of many kinds. There is also the tuna crudo tacos and the barbacoa tacos, which offer tremendous flavor. We also like the Portobello mushroom quesadillas for something different. The platos fuertes offer Mexican dishes that may not be eaten with your hands. They also tend to be a bit less traditional. The Jalapeno-Garlic Tiger Shrimp are great for shrimp lovers. When you talk about Sabor with friends (or random people on the internet), inevitably the guacamole and tacos dominate the conversation. However, dessert is Sabor's secret weapon. In short, save room for dessert because it is definitely worth it. Each table will receive a tray of desserts that are comprised of flan, chocolate-banana empanadas, churros and more. My favorite desserts at Sabor are the chocolate crepe filled with cayenne chocolate & marscapone sauce, chocolate & banana empanadas, cafe con leche. You would not be wrong for loving any of the others, because they are all outstanding. Having dined at Sabor Modern Mexican on three different occasions while on Navigator of the Seas, I feel confident in declaring the guacamole still as terrific as ever, and Sabor in general, an absolute favorite dining choice. When readers ask me for a recommendation of what to see or do on Navigator of the Seas, I will continue to recommend Sabor with flying colors. Sabor's menu has barely changed since its debut and that is a testament to how good the food and experience is inside. The cost for dinner is $30 per guest, and lunch comes in at $20 per guest. Prior to our cruise, Royal Caribbean's Cruise Planner listed it for just $15 per person, making it an absolute steal at that price. Even if you prefer to wait to make reservations onboard, be on the lookout for discounts. We saw discounts being offered by restaurant staff throughout the sailing at various events and venues. Sabor Modern Mexican is open for lunch on sea days between noon - 1:30 p.m. and dinner every night between 5:30 p.m.- 9:30 p.m. for dinner. 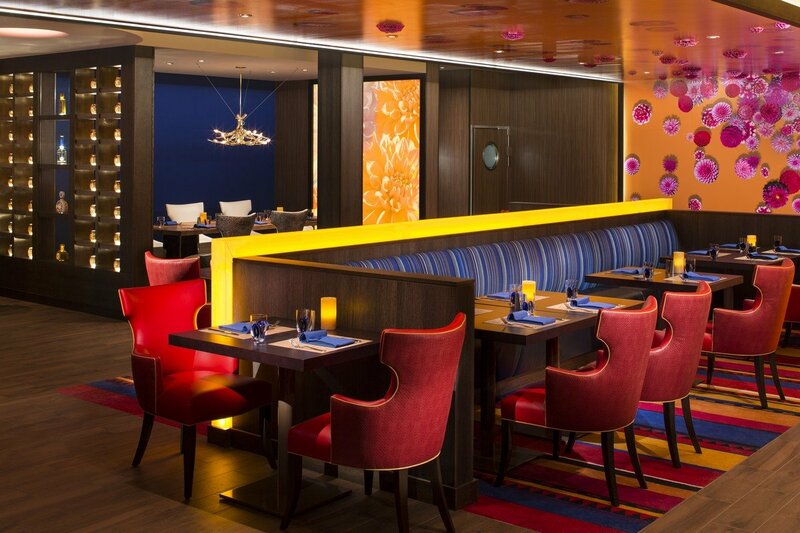 We reviewed Sabor Modern Mexican aboard Navigator of the Seas. Cost: The price for Sabor Modern Mexican on Navigator of the Seas for lunch is $20 per guest and dinner is $30 per guest.